Xavier Thoughts: What kind of Gun Collector am I? What kind of Gun Collector am I? When I look at the wide variety of guns that have avoided being traded off from my collection over the years, I wonder if there is a unifying principle behind it all. Well to start off with, I buy what I like, not what somebody thinks I should own to fill a "hole" in my collection. That makes me an accumulator to many, but if you ask me, it makes me a happy, contented collector. I've never regretted trading off a gun, probably because I do it so seldom, and only for a gun I like better. So, what do I like? Looking at my accumulation of guns, I see several very definite trends. In general I want guns I can shoot, and guns I enjoy handling. I have very few non-shooters. I like 1911s. I will alter a 1911 to fit my tastes and needs without reservation. These are my shootin' guns. 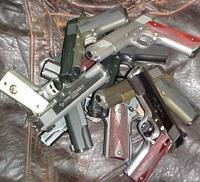 Most are .45ACP, but I do have a 9mm Commander I like a lot. All my 1911s are subject to carry if need be. Most are Colts. I own a couple of Springfields. The Springers introduced me to 1911s, so I am loathe to relinquish them. I only consider Colts now though, and I modify them to fit my needs. I am still looking for a WWI 1911 that I can afford. I'm not real picky, but I want the 1911, not the 1911A1. I would prefer one with some wear, but original. When I find it, I hope to purchase it from the man who carried it, or his wife or family so I will know it's history. Obviously, that 1911 will be safe from modification. Along the same idea of my 1911s are my shotguns. These are purpose built guns for home defense, nothing more, nothing less. I like them for the simple less is more principle they represent. I like S&W wheelguns. I prefer pinned barrels, recessed cylinders, hammer mounted firing pins, and no locks. Blue is fine, nickel is OK, and stainless will do. Finish wear matters little. A few Colt wheelguns have wiggled into this accumulation, but they were good ones. If I had to pick any area of specialization here, it would be K frames. 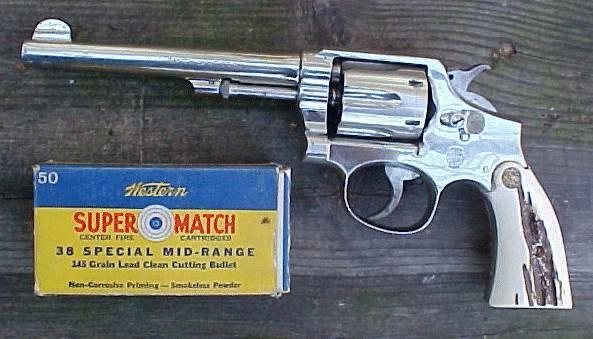 .38 Special. That's my revolving meat. All of these are shooters. I get a kick out of punching bulleyes with a 75 year old gun while a tactical tupperware spray and pray youngun looks on. 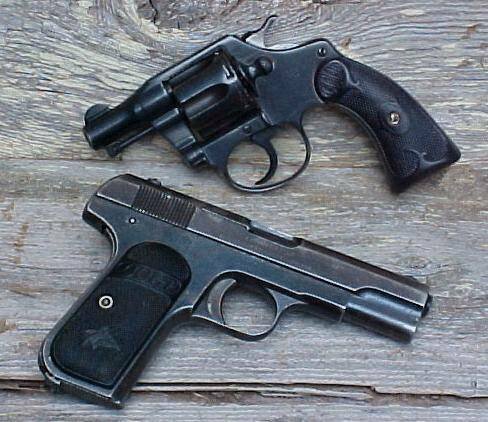 I like vintage concealed carry guns. Guns that were somehow altered to facilitate discrete but lethal protection from criminals over the years. The world of concealed firearms was very different 50 years ago. The work done by gunsmiths to arm men who needed hidden protection interests me. I will accept obscure calibers in this area, as I buy these guns mostly to fondle and have. A couple were given to me by their owners, and I cherish those. I have not introduced derringers into this area of my collection. I'm not sure why not, but it doesn't feel right. I like old .22 plinkers. This is a nostalgia thing. Shooting them reminds me of popping cans when I was a kid. There isn't anything wrong with that. Condition doesn't matter, as long as the thing will feed ammo and safely shoot. MKIIs, a Duramatic and a Woodsman. I use these pistols to teach, as well as hone my own trigger skills and just to have fun with. 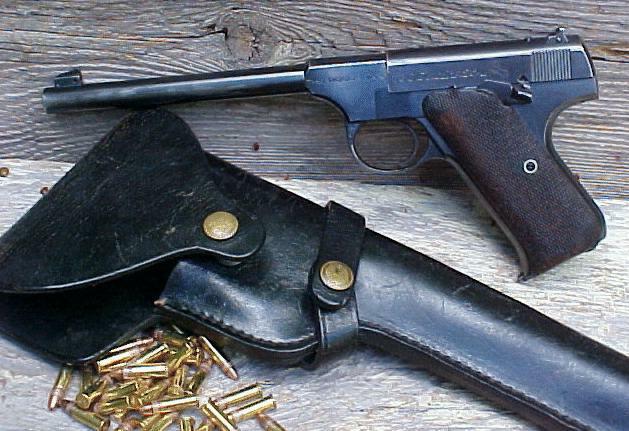 The cheapo .22 plinkers of today just don't wet my whistle. The ones of yesteryear were finely crafted target machines. There is the Mil-Surp stuff....Star pistols, CZs Walthers, a Luger, a Tokarev, a Makarov, and several Mil-Surp rifles. My wife claims most of these, and she loves the history that goes with them. Then there are the Ruger 10/22s I have modified. Who can explain that madness until they shoot one? I have a Marlin and Savage .22 plinker rifle in this mix as well, and a couple of others. So with this unrelated accumulation of firearms, is there any common thread to make order from the chaos? I suppose there is, I like them all. That's good enough for me. Great collection! And an absolutely excellent "unifying principle." Great philosophy. I modified somewhat collectible Ser 70Mk IV with an SM prefix serial number, for daily carry, a few years ago because I abhor the idea of owning a 'fighting gun' that I can't fight WELL with. (I'm left handed). My thoughts are probably somewhat similiar to yours on collecting: use and not abuse it ok, function and form over popularity and 'collectibility', and fun over all of it.